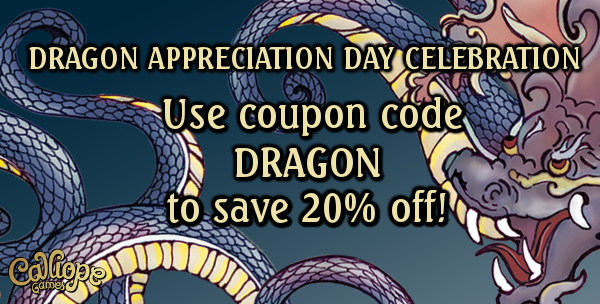 Have you shown appreciation for your dragon lately? Think of all the things that dragons do for you in your everyday life. And yet, for the most part, they go totally unappreciated for it all. Well, this coming Saturday is Appreciate a Dragon Day (so I'm told), and so you should be sure to appreciate your dragon. Calliope Games is also having a sale in honor of the date. If you'd like to get Tsuro or Tsuro of the Seas, just use the code DRAGON during checkout to get 20% off your order. Because, you know, if you're going to have Appreciate a Dragon Day, you should play games that include giant dragons in them.